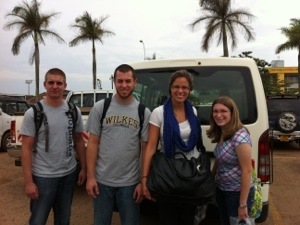 ← Off on Our Ugandan Adventure! Hi all! Sorry for the delay in posting but wifi isn’t as available as I’d hoped. But I did just get my USB Modem reactivated so I should be up and going now. After a very long trip- 7 hr to London, a 11hr layover, then 8 hr to Entebbe Uganda we finally arrived yesterday morning (Sunday at 7:30am). Today was our first day at Makerere University school of pharmacy. We spoke at length with the faculty and planned the rest of our activities. We had a long tour of the hospital by the head pharmacist. Tomorrow morning we will go back to the hospital and start our volunteer work. This entry was posted in My Safari (My Journey/Adventure). Bookmark the permalink. Sounds great!! What did you all do in London??? Glad you guys made it safely! Enjoy the experience!